Multi-millionaire Paul Sykes has said he will do whatever it takes to make sure UKIP wins the EU elections next year and is expected to spend millions of pounds doing so. 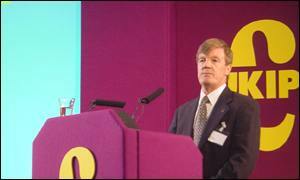 Sykes donated £1.5m to UKIP in 2004 and in the last few years has been sponsoring Tory MPs who pretend to be eurosceptic. He has told a Telegraph reporter that he's supporting UKIP because "I am certainly not wasting my time, energy and money on any of the others". This will provide a real boost to UKIP in next year's EU elections. The Tories and Lib Dems are backed by millionaires and Labour is funded by the unions. All three of them will get taxpayers' money to campaign for greater integration with the EU during the next election whilst UKIP relies on donations from members and supporters.